I was disappointed some time ago when the Gaucho Grill closed on the Santa Monica Promenade, but I instantly forgave them when it was replaced by Lotería Grill. I used to go to their original location when I lived near the Farmers Market on Third Street, but this is a much more inviting restaurant, and the food is every bit a good as it always was. A long-time favorite has been the carnitas burrito with salsa morita, but this was the first time I had the entire “platillo.” Morita chiles are smoked, red-ripe jalapeño peppers, like chipotle peppers, except they are smoked for a shorter time. Interestingly, Lotería’s salsa packs more of a punch than I would have expected from a jalapeño. 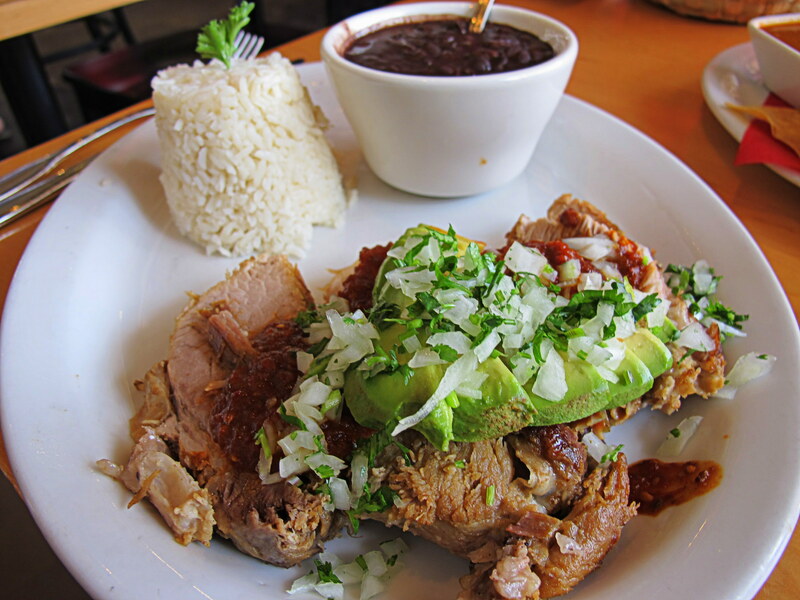 The rich, almost fruity flavor goes beautifully with the perfectly cooked pork, and the sides of rice and black beans provide a nice balance. This entry was posted in Food! and tagged Carnitas, Chili pepper, Cook, food, Home, Jalapeño, Lotería Grill, Morita chile peppers, morita peppers, Salsa, Santa Monica, Santa Monica Promenade by brucecritchley. Bookmark the permalink. I always love Gaucho Grill too. Loteria Grill looks good; I’ll have to try the carnitas next time I’m in LA.